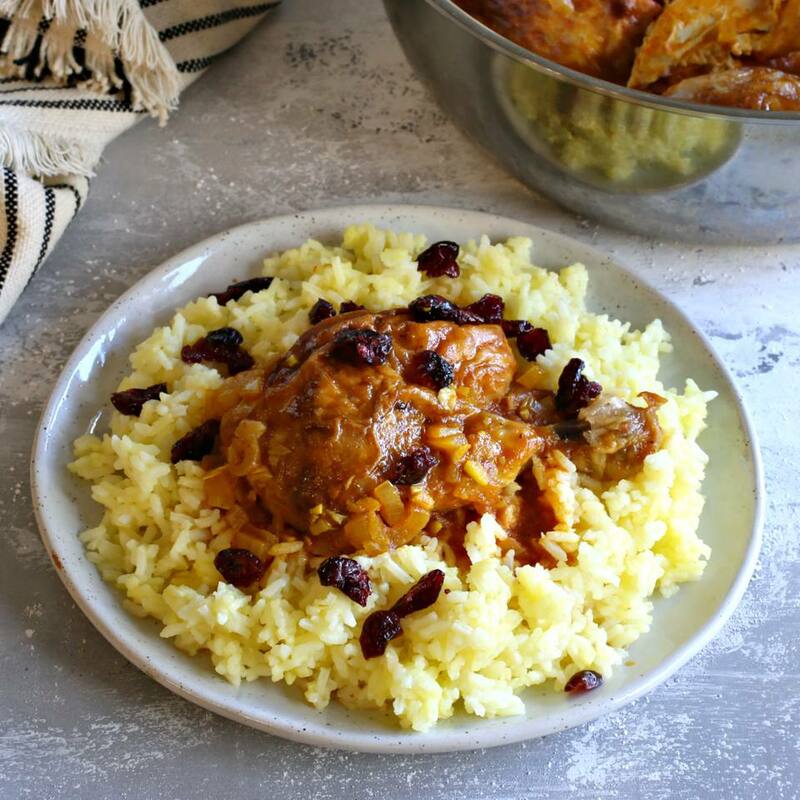 This dish, often called zereshk ba morgh, is a popular Iranian meal of chicken and rice with saffron. The word morghe means chicken and polo means rice. The word zereshk means barberries, which are common in Persian rice dishes. The berries have a sharp, sour flavor and are often cooked with a bit of sugar before being added to saffron rice. You can source them in Middle Eastern markets and specialty stores but if you can't find them, we recommend using dried cranberries, which are more readily available and provide a similar sweet and sour flavor. As with so many Middle Eastern dishes, there are lots of variations for this dish, but the key components of chicken, rice, saffron, and berries are always included. Although there are a few steps involved, the actual cooking process is fairly simple. To bloom the saffron, crush the threads with your fingers and add them to a small bowl. Add the hot water and let sit for 15 minutes. To prepare the chicken, heat the tablespoon of olive oil in a large skillet and add the chicken, skin side down. Season with salt and pepper and cook until lightly golden brown on both sides, about 10 minutes. Remove from the pan and set aside. Add the remaining tablespoon of olive oil to the pan along with the diced onion. Saute until the onion becomes translucent. Stir in the garlic and continue cooking for a few more seconds. Stir in the tomato paste and then add the water, salt, black pepper, turmeric, and 2 tablespoons of the saffron water. Add the chicken back into the pan, cover, reduce the heat to medium-low and cook for approximately 30 to 40 minutes, until the chicken is tender and cooked through. To make the saffron rice, add the rice and water to a pot and bring to a boil. Cover, reduce the heat to low and cook for approximately 15 minutes or until all the water has been absorbed. Remove from the heat, season with salt and the remaining tablespoon of the saffron water. Stir in the dried cranberries. Serve the chicken and sauce over a bed of the rice.